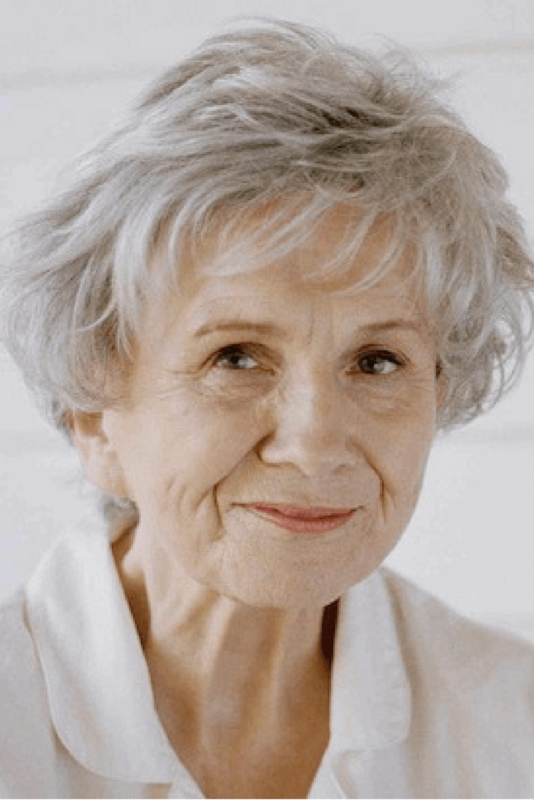 When you show your story’s setting from the viewpoint of character who narrates (rather than an omniscient, impartial narrator), you can colour the scene with your narrator’s perspective. Setting description does extra work, then, by suggesting a character’s outlook and psychology. At this time, many people […] were putting in what were called patio doors […]. These were usually left uncurtained, and the two oblongs of light seemed to be a sign or pledge of comfort, of safety and replenishment. Why this should be so, more than with ordinary windows, Joyce could not say. Perhaps it was that most were meant not just to look out on but to open directly into the forest darkness, and that they displayed the haven of home so artlessly. Full-length people cooking or watching television – scenes that beguiled her, even if she knew things would not be so special inside. When you describe your own settings, think similarly about what details your character might notice given their past experiences and present psychology. Joyce’s own disillusionment with the idea of idyllic ‘home’ life (her partner Jon leaves her for his assistant who moves into their former home) filters through Munro’s setting description. Time is also an important element of setting, as much as place. In E. Annie Proulx’s novel The Shipping News, for example, Newfoundland’s dwellers fear winter because navigating the snowed in roads and coastline become much more treacherous. The arrival of winter, a change in the season of the story’s setting, increases the story’s tension significantly. The best thing in winter was driving home, after her day teaching music in the Rough River schools. It would already be dark, and on the upper streets of the town snow might be falling, while rain lashed the car on the coastal highway. The time of year (winter) and the time of day (night) together create a hushed tone that fits with the story’s slowly developing portrait of a woman learning to cope with the quiet disappointments of the past. Setting a scene on a bright sunny day at a busy beach has very different implications for tone and mood compared to setting a story in a forest on the edge of town at dusk. Think about how season and time of day can mirror your characters’ psychologies or subtly echo the scenarios they will encounter. 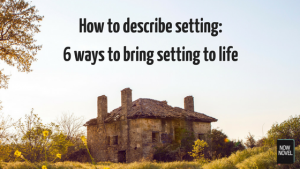 Describe setting so that you show how your characters live in and act upon it. This lets readers see how your characters and settings impact each other. This makes both more believable. What she saw when she turned in to her own unpaved puddled driveway was the set of these doors put in by Jon, framing the gutted glowing interior of their house. The stepladder, the unfinished kitchen shelves, exposed stairs, warm wood lit up by the lightbulb that Jon positioned to shine wherever he wanted it, wherever he was working. The house itself as setting conveys something about the type of person Joyce’s spouse Jon – a woodworker – is. He is constantly working on their home. Everywhere are signs of his life and livelihood (the ‘unfinished kitchen shelves’ and ‘exposed stairs’). 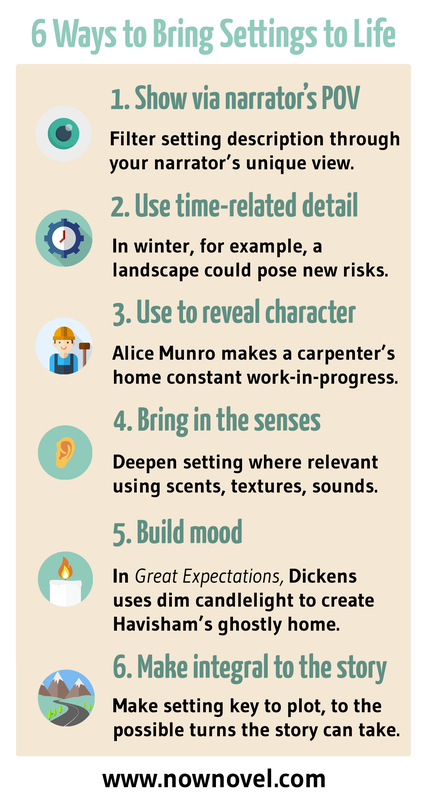 When describing settings – especially homes – think about your characters’ personalities and vocations. What might a fastidious libarian’s home look like inside, versus an eccentric artist’s house? Practice using multiple senses as these are key to understanding how to describe setting vividly. What characters see, hear, smell and (perhaps to a lesser degree) taste all help to anchor a scene. It didn’t help that it was spring. Every day, people seemed more and more unclothed. The magnolia trees, budding on the green, looked positively enflamed. They sent out a perfume that drifted through the windows of Semiotics 211. Here something as simple as the scent of budding magnolia trees adds to the impression of the campus setting. As you describe setting, think of prominent smells, sounds and other details that will give a clearer impression of place. When we talk about ‘mood’ in fiction, we mean the pervasive atmosphere. The Gothic, gloomy feeling of Miss Havisham’s dilapidated mansion in Charles Dickens’ classic novel Great Expectations is a good example of how setting description builds mood. We went into the house by a side door, the great front entrance had two chains across it outside, and the first thing I noticed was that the passages were all dark and that she had left a candle burning there. I saw that everything in my view which ought to be white, had been white long ago, and had lost its lustre and was faded and yellow. I saw that the bride within the bridal dress had withered like the dress, and like the flowers, and had no brightness left but the brightness of her sunken eyes. The melancholic mood and the atmosphere of neglect deepens with each subsequent description. This creates a cohesive sense of setting. The Gothic mood of Dickens’ setting mirrors the nature of Miss Havisham who hides, embittered, in her boarded-up mansion. Building setting up this way helps to clarify our mental image of the setting as well as its inhabitants. Setting is especially vivid when it is significant to the unfolding events of the story. In Tolkien’s Lord of the Rings cycle, shifts in setting introduce new challenges, opponents and obstacles. Everything in the villain Sauron’s home territory, Mordor, is more dangerous and ominous, from the terrain to the local inhabitants. Tolkien is a master of making setting an acting driver of story in this way. For example, in the first novel in the cycle, The Lord of the Rings, the party must attempt to pass through the dark Mines of Moria after they fail to cross the Misty Mountains. Here in the dark the party is attacked and a pivotal member falls. It would be hard to imagine a key, powerful character being lost this easily overland. Yet the Mines of Moria create an ‘other’ place, a new context where anything could happen. Use shifts in setting to raise stakes as Tolkien does. Or use it to create new character goals or obstacles that further the story towards its destination. Practice how to describe setting so that it suggests the approach of new possibilities or obstacles for your characters. This will make setting active and interesting.